Preparing for relatives and friends to come stay at your house can be an enjoyable yet stressful experience. Creating a comfortable bedroom for your guests is important to make them feel welcomed and relaxed when they are away from home. Often not a priority, the guest room can be one of the most neglected rooms of the house. You might wonder where to start? All beautifully decorated rooms begin with brainstorming room ideas and a plan. Before you begin your project, ask yourself this: how could I use this space beyond a guest bedroom? Read on for some fun and functional room ideas for you and your guests to enjoy! Check out these guest room ideas to transform your space in a way that is simple and won’t break the bank. 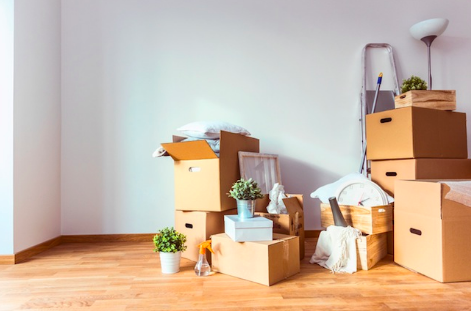 Often functioning as the “spare room” of the house, guest bedrooms are where you put away extra clothes, shoes, bedding, toys, or office equipment. However, in order for this room to actually function as a “guest bedroom”, decluttering is a top priority. You need to get rid of junk and items that you will never use. Sometimes, it is hard to get rid of items that you might be emotionally attached to. You need to ask yourself, do you feel any connection to these items anymore? Are you ever going to wear that leather jacket again? If not, put them aside and donate them. You cannot create a comfortable space for your guests without starting here first. Since this room is usually used for storage, make sure to create a storage space that can be used both by you and your guests. If your guest room closet is big enough, divide it into two sections. Firstly, create one section that could be designated space for your family’s belongings. Add shelves and a hanging rack with coat hangers to keep your section neat and organised. Secondly – have empty shelves for your guests to unpack their clothes on. Have an empty hanging rack with coat hangers for them to use for jackets, coats, etc. If your guest bedroom is big enough, add a chest of drawers so your guests can unpack their belongings in that instead of your storage closet. Hang hooks on the back of the bedroom door for jackets. Freestanding clothing racks are also functional and don’t take up too much space. If you need more storage space, opt for a storage bed – where all the clutter will be hidden underneath. Getting a good night’s sleep can make or break your day. The bed is the first thing your guests will see when they walk into the room. Make sure the bed is made up with comfortable sheets and duvet. 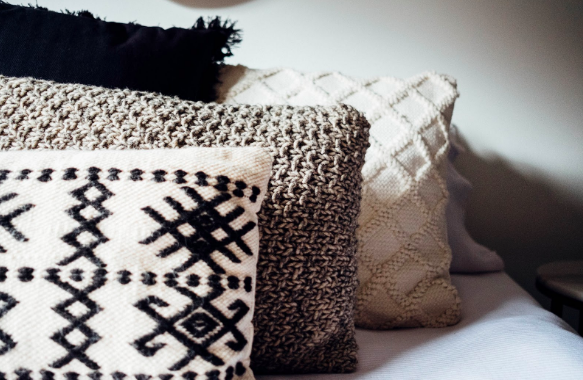 Add fluffy and comfortable pillows to make it feel more inviting. Add a throw blanket to the end of the bed. Make sure your colour scheme is consistent and matches the other items. Opt for neutral and calming colours to create a classic look. 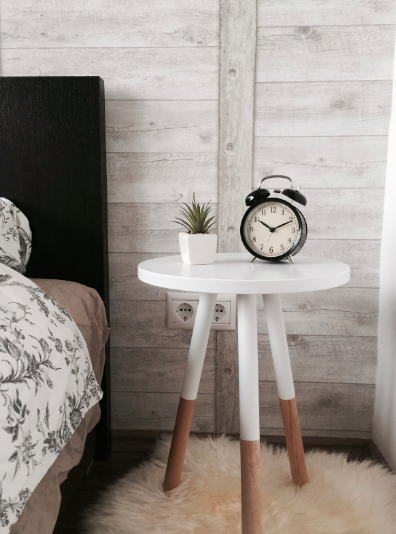 Bedside tables are an important item to consider and they can create the overall look of a room. You need to make sure your guests have a place by their side to put down glasses or a water bottle. You don’t have to buy an expensive bedside table – be creative and use a simple stool or storage boxes to function as a bedside table. If you’re looking into guest room ideas, consider the colour of your guest room and the tone this can set. Guest rooms tend to be the smallest room in the house, you don’t want to paint it a colour that’s going to make it look even smaller. Opt for lighter colours and a white ceiling to give the illusion of space. No matter how you decide to decorate, the most important factor is to make your guests feel like they’re at home. Thinking of the little details ahead of time can really go a long way. Look around the room for ways you can make it more comfortable for your guests. Have a basket stashed with clean towels, a comfy robe and extra blankets. Put books and magazines on the bedside tables. Have a reading lamp on the table which won’t take up too much space. Put scented candles around the room or even brighten it up with a vase of fresh flowers. Are you looking to embark on a new home building project or renovate your home? Book a call with our team or call 1800 184 284 for free, expert advice. Manya graduated with an Honours degree in 2018 in Creative and Professional Writing. Alongside that, she is passionate about interior design, house renovation and art.